Follow recommended food safety guidelines to reduce the risk of food poisoning. The holidays bring about changes to the home. Take a look around at the child’s eye level to identify possible safety risks. Inspect toys and gifts for potential hazards before allowing your child to play with it. Poisonings never take a break, even during the holidays. Missouri Poison Center is always ready to help, every day of the year. One of the best pieces of advice we give is to program the poison help phone number into your mobile phone: 1-800-222-1222. Being prepared and calling right away is your best bet – you’ll be speaking with a poison specialist within seconds to get the help you need! Food safety guidelines are very important to know and follow. Appetizers set out early should be put away before the meal is served. When serving a holiday buffet, keep cold food cold, and hot food hot. Meat should be cooked to the appropriate temperature based on the cut and type. After the meal, food should be put in containers and stored in the refrigerator to avoid bacterial growth. Check out foodsafety.gov for useful information, there is even an app to help keep this information right at your fingertips: https://www.foodsafety.gov/keep/index.html. Traditional holiday plants such as mistletoe, poinsettias, and amaryllis bring a bit of the outdoors inside during the cold, winter months. The plants and berries are beautiful, but might look like food to young children. In general, each of these plants can cause symptoms such as vomiting and diarrhea if eaten in large enough amounts. Keep all plants out of reach and don’t forget the pets! If there has been an ingestion of any winter plant, why wonder or worry? Call the poison center right away for answers. For more information, check out our post about winter plant safety. Holiday parties are an adventure for a toddler and their curiosity meter goes into overdrive with so many new things to see, taste, and touch. We suggest checking out this new environment at your child’s eye level to identify possible poison hazards. Ice melt products can be inadvertently brought into the home from the bottom of shoes. Of course, a toddler will not only find it, but will put it right into their mouths. Keep the bags and buckets of ice melt out of sight and reach of children because their salt content can be a problem if ingested in large enough amounts. Look around the Christmas tree area, needles from the tree are likely to be on the floor, and there is usually a stray piece of tinsel or an ornament to be found. These items can be a choking hazard if placed in the mouth. Don’t forget about the scented plug-ins placed in outlets right at kid level. These can cause irritation to the mouth and upset stomach if swallowed. Hand bags and purses are frequently set down on the floor and not watched closely. For a toddler, a purse is a treasure waiting to be explored. Cosmetic products are not likely to cause symptoms, but medications can be serious, so be sure to keep hand bags and purses up and away. Don’t forget about the alcoholic beverages sitting out on the table, a child may come by and drink from the wrong cup. Depending on the amount and strength of the beverage, an intoxication can occur. If a child drinks an alcoholic beverage, call Missouri Poison Center right away! Gifts are a kid’s favorite part of the holiday party. Once they have been opened, there’s wrapping paper and bows thrown all about and the kids start trying out their new toys. Keep in mind, anything small enough to fit in a baby’s mouth will go in their mouth and can be a choking hazard. Science kits and art supplies are intended for older children to use under adult supervision. Commonly, there are small pieces present, along with brightly colored paints and chemicals. If possible, save the box or package insert to make identification easier if an exposure occurs. Disc or button batteries come with many toys and other objects that make sound or light up. If swallowed, the batteries can lead to serious symptoms, no matter the age of the child. Any device that comes with a button battery should have a compartment that is secured with screws. Make sure the screws are securely tightened to keep little ones from getting into the battery. Even if you SUSPECT someone has swallowed a battery, call the poison center immediately for individual recommendations. When it comes to button batteries, you do not want to wait or take any chances. Rare earth magnets are typically given as a gift to an adult to keep on their desk as a creative outlet and stress reliever. If a child swallows more than one unattached magnet, they can attract to each other in the intestines and cause damage. One surgeon described the damage as being similar to a bullet wound, without the entry and exit points. The best advice is to keep these magnets away from children of any age. They should never be allowed to play with them. Holidays bring a change in our normal routine, but child safety precautions remain the same. Guests, such as grandparents, may be spending the night in your home. Be sure they keep all toiletries and medications up and out of sight of little ones. If the kids are staying over at the grandparent’s house, make the necessary safety changes before the kids come over. Medication errors are common due to changes in your usual sleep and wake up times. If you have accidentally double-dosed or skipped a dose of your medication, call the poison center, we are there to help get you back on track safely. 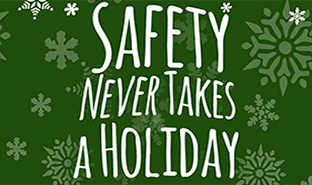 If you have questions about holiday safety, call the Poison Help line at 1-800-222-1222. Specially trained nurses and pharmacists are available 24/7/365. The service is free and confidential. Providing Your Information During your chat session, you may be asked to provide us some demographic information such as email address, zip code and age. The Missouri Poison Center is committed to your privacy and agrees to keep your information confidential. If you choose to share additional personal information with us, it will be used for internal purposes allowing us to better serve you. Any information provided by you will be disclosed in accordance with applicable local, State and Federal Laws and regulations. A transcript of your chat session between you and our Specialist is recorded and stored for quality assurance and training purposes. Automatically Collected Statistics When you visit to our website, we automatically gather information about your visit. This general information identifies you as a unique visitor to our web services and does not provide us any other personal information about you. This information allows us to report on the traffic on our webpage so we can understand the impact of our work and improve your future online experience with us. This information is viewed and reported aggregately. Chat Session Agreement With any online service, there is some level of risk when communicating over the Internet. By reading and agreeing with this Privacy Disclaimer and engaging in one of our Chat Sessions, you give permission to the Missouri Poison Center to provide you some assistance today and to use the information your provide to us for future reporting purposes. Furthermore, you understand that the Missouri Poison Center will undertake all efforts to protect your information, but it is not responsible for any information you may enter during the chat session. The Missouri Poison Center provides chat service only for those residents in Missouri.